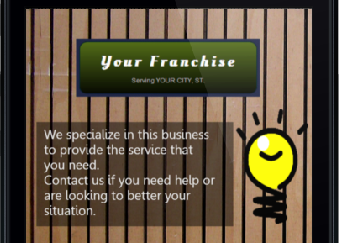 Nowadays, it’s very important for your franchisee sites to be optimized for mobile devices. If you’re not, you could lose some leads. All that business is now going to your competitors! According to a research Google did, around 47% of consumers use their smartphones to search for local franchises. Even more, 67% said that they’re more likely to purchase a product or service if the site is mobile-friendly. As a franchisor, it’s very important that you look out for the upcoming trends and use them as an opportunity to further expand your (and your franchisees’) business. First of all, let’s look at some examples. In the image on the left, you can clearly see that this site is not mobile friendly: it doesn’t fit right, it cuts off the text, the navigation menu is nowhere to be found and the users would have to do a lot of scrolling just to see your whole site. On the right, there’s an optimized version of the site. As you see, there’s a clean, organized design that only showcases important information and the calls to action are visible and clickable. Keep this in mind because we’ll come back to these examples quite a bit in this post. But how to ensure your franchisees won’t fall into the digital age gap? Look out for these mistakes you may want to avoid so your franchisees’ websites are ready for all those mobile visitors! What mistakes should you avoid in a franchisee mobile landing page? Think a of a scenario where a lead is looking for a restaurant. They want to find a place to eat in a specific zone but, upon accessing your site, they notice you don’t have a way for them to get to you. Sure, you have your address but this will force them to look you up in another app. So what do they do? They’ll probably move on. In this example, a potential customer has an emergency that they’re looking to solve as soon as possible. With the “Click to Call” option, your users will be able to click (be it a button, image or text) and the smartphone will immediately dial and call your business. This is great because you totally eliminated the step where they have to write down your number to dial it later. Consumers will be able to contact you faster and they’ll remember that next time they have an emergency. 61% of mobile users would like a “Click to Call” option in mobile sites. With this feature, they’ll feel that you value their time and that you’re there for them just a click away. In this next image, you’ll have a visual reference for the Click to Call button. First of all, a Call to Action (CTA) is one of the most important elements for every site. It more commonly refers to a button, but it can be any piece of text or information on your site that gets your leads to convert in essence, maximizing lead generation. With mobile users, it’s more important than ever to have a clear, visible, easy and prominent CTA. Remember, the screen of mobile devices is smaller than those on a desktop computer or laptop, so your visitors need to find your CTA at a first glance. In the example on the left, the user would see a messed-up site with no visible call to action (phone or address) and this could be frustrating for him/her. According to HubSpot, a visitor stays on a site 3 to 5 seconds before deciding if it’s what he/she wants. Use this information as an opportunity and engage the mobile user with your site on that lapse. What does this mean? Plain text can result on a boring landing page. Again, let’s go back to the example at hand: the site on the left is nothing but text (which you can’t even see completely!). Take into consideration that touch screens are meant to be touched and clicked. That’s why buttons will become your best friends: instead of displaying all your info in a single page and giving them a never-ending page where they have to scroll and scroll to get through your content, use buttons to redirect them to those other pages they want to look through. In the example to the right, you’ll see that the landing page concentrates on the core information, but includes content that visitors may find useful with the help of buttons. The way a user interacts with his/her phone is crucial and you should take it into consideration when providing a mobile landing page. For instance, your page should be responsive. What this means is that it should adapt to the width and tallness of different screens. As you may have noticed, different mobile devices have different dimensions and your site needs to fit correctly in each one. According to Google’s research, 64% of users said they only want to scroll up and down, not left and right. By making your site not responsive, the page may look awkward in other devices and can cause your users to have to scroll up, down, left and right just to find the information they need (like in the example on the left). Another thing to think about is their fingers. Your users’ fingers now work as an extended tool for that mobile device. This means that they’re tapping, clicking and going through your information with their fingers. On that note, nothing is more annoying than clicking one option and realizing that you clicked something else by mistake. Buttons should be big enough so that your users’ fingers won’t stumble upon other buttons or options. Again, immediacy is key here. Mobile users want to find what they’re looking for in a short amount of time or else, they’ll move on to another site and to another business. This means that every piece of information should be one or two clicks away. Don’t make it a puzzle for them. Make the information they want to find accessible. I know that by trying to only put the main objective in your mobile site, you may feel the need to leave everything else out but you need to still include a way for the users to find the information they’re looking for. Content can be tricky in a mobile landing page. Some may advise that you don’t add real text at all. This is because, while a “regular” site is all about images and narrative, users on a mobile device are there to get punctual information. Given the space constraints, it can be fairly easy to end up with a cluttered landing page. Be smart about its design and really focus on your main goal. Everything that can be placed in the back-burner, should. Visitors much prefer a clean and organized design that leads them to the core of your business, but that gives them the opportunity to learn more about you if need be. Remember that these are people that really value their time and they won’t want to deal with slow-loading mobile pages because you added too much stuff. In the end, you should worry about including: your logo, CTA (or main goal), phone or address and a navigation strategy that will allow the visitor to go through more content or to the “normal” non-mobile site. Get On With The Times! You may think that your customers don’t use mobile devices but this is a growing trend that will one day include the big majority of Internet users. A tool like Empowerkit may be able to get you on with the times because, while it specializes in franchisee websites, you can also design a mobile landing page with it. So maybe you should give it a try! Now that you have all of this information (and a way to put it to good use), don’t lose all of those leads by having an unfriendly mobile site. Think about your users and get yourself out there for everyone to find you, no matter what they’re using to do so. Your business runs on customers so if they want a mobile friendly site, you should try and give it to them. If you’d like to read Google’s research (What Users Want Most From Mobile Sites Today), click on the link. If you have any other questions about this post or Empowerkit, don’t be afraid to ask!